For The Moon There Is The Cloud - (tales in the Zen tradition) - Collins, Pathways Reading scheme, 1996. The World`s Smallest Werewolf - Macdonald, Shivery Storybooks 1996. Meditations For Busy People (How To Stop Worrying & Stay Calm) - HarperCollins 1996 (USA 1996 as A Little Book Of Joy). Dreamcastle (pre-teen SF), Orion Children`s Books 1997 / Mondadori, Italy `97 (also Germany, Portugal, Norway, France and China). Dino Discoveries (non-fiction 7+) - Henderson FunFax Dinosaur file, 1997. Imagine That! A Handbook Of Creative Learning Activities for the Classroom, Network Educational Press, 1997 (reissued in 2007 as A Handbook of Creative Learning Activities, Network Continuum). Another Girl, Another Planet (adult SF, with Martin Day) - Virgin New Adventures, 1998. Roy Kane - TV Detective - A&C Black`s Graffix series, 1998, p/b `99. Self-Intelligence - A Handbook for Developing Confidence, Self-Esteem & Interpersonal Skills, Network Educational Press, 1999. Dreamcatcher - for Orion`s Dreamtime teen fantasy/horror series, Spring 2000. (Steve is also Consultant Editor for this series). Horror At Halloween / Eleanor  a Horror novella which is one segment of a `mosaic novel`, Pumpkin Books, Spring 2000. The Planet Machine  a science fiction story for A&C Black`s new Comix series, winter 2000, p/b spring 2001. Catch & Other Stories  p/b genre stories for 10+, Crazy Horse Press, 2000. Ice (The Wintering book 1)  Fantasy/SF saga for 11-upwards, Orion 2001. Internet@file-online.com  a fun wallet for kids on using the `Net, Top That 2001. What`s The Story?  games and activities for creative storymaking. A&C Black, 2001. The Frankenstein Steps & Other Adventures (DDG book 2)  Network Educational Press, 2001. Storm (The Wintering book 2)  Orion 2002. Thaw (The Wintering book 3)  Orion 2002. Catch Horror Minitales.  Network Educational Press, 2003. The Passenger & Other Stories (DDG book 3)  Network Educational Press, 2003. Philosophy Bear & the Big Sky. If I Were a Spider. 50 Ideas to Boost Your Writing, NAWG Publications 2005. This is a practical handbook for aspiring writers. 100 Ideas for Teaching Creativity, Continuum 2005. This teacher handbook is part of Continuum's new 100s series / 2nd edition 100+ Ideas for Teaching Creativity, Continuum 2007. 100 Ideas for Teaching Thinking Skills, Continuum 2006 / 2nd edition 100+ Ideas for Teaching Thinking Skills, Continuum 2007. Boys & Writing - Pocket PAL series (Practical Aided Learning), Network Continuum Education 2006. Success in the Creative Classroom: using past wisdom to inspire excellence (co-authored), Network Continuum 2007. Emotional Intelligence  Pocket PAL series, Network Continuum, 2007. 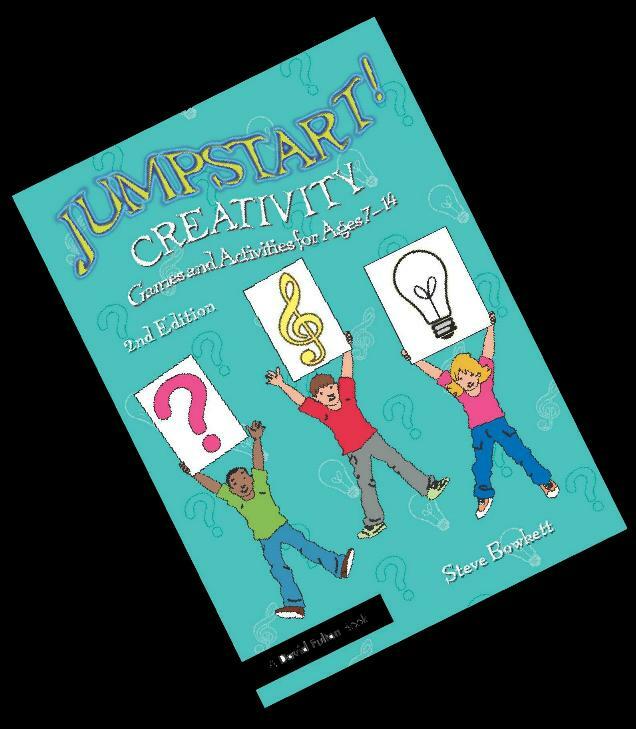 Jumpstart Creativity  David Fulton / Routledge, 2007. Halloween Pie - short stories and poems of betwixt and between - Mushroom Books NAWG Publications 2007 (a self-published collection). The Handy Little Book of Writing for Children  NAWG Publications 2008. 100 Ideas for Creative Development in the Early Years (with W. Bowkett)  Continuum 2008. 100 Ideas for Good Practice in the Early Years (with W. Bowkett)  Continuum 2008. Happy Families: insights into the art of parenting - (co-authored), Network Continuum 2008. Countdown to Creative Writing  David Fulton 2008. Countdown to Poetry Writing  David Fulton 2009. Countdown to Non-Fiction Writing  David Fulton 2010. A Moon On Water - (co-authored) Crown House 2010. 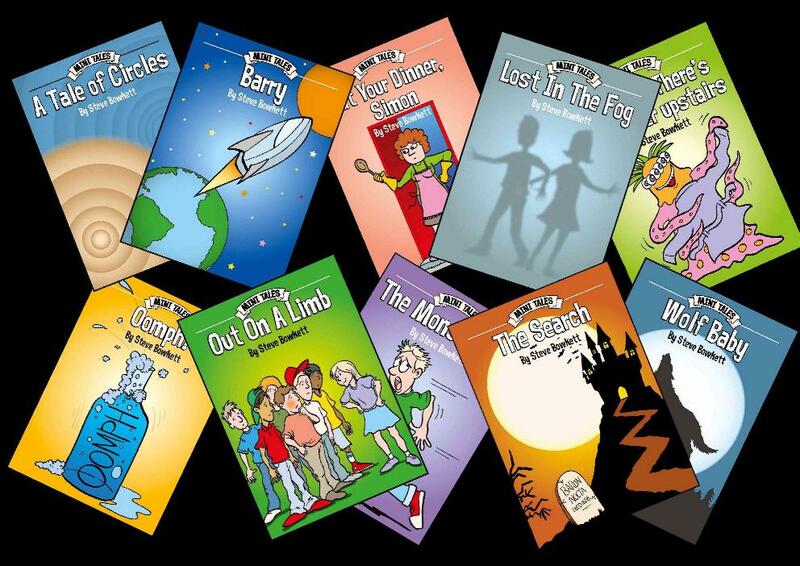 Developing Literacy and Creative Writing Through Storymaking: Story Strands for 7-12 Year olds  Open University Press 2011. 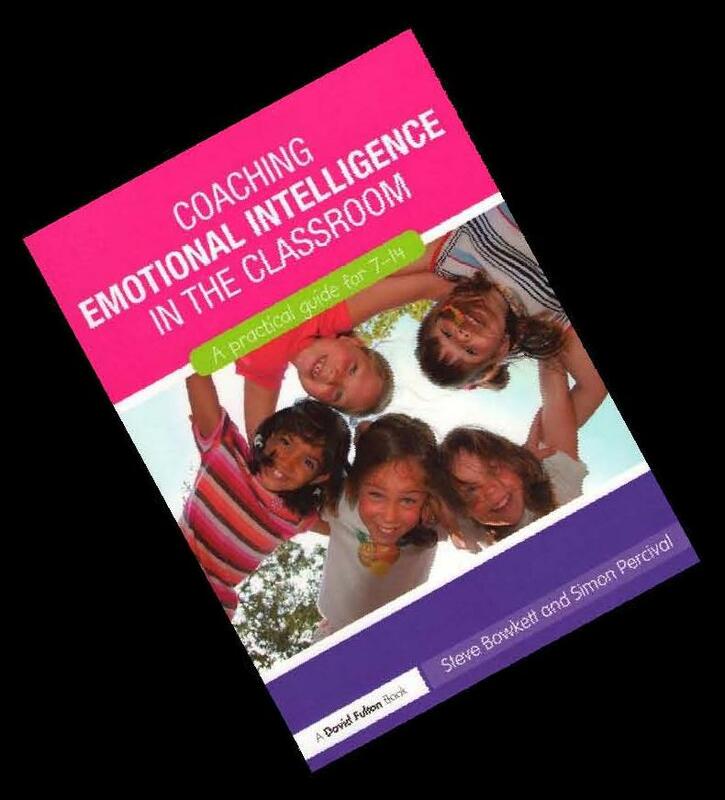 Coaching Emotional Intelligence in the Classroom (with S. Percival)  David Fulton 2011. Using Comic Art to Improve Speaking, Reading and Writing (with Tony Hitchman) - David Fulton 2012. Love At The Fairground - Urbantopia Books 2012. 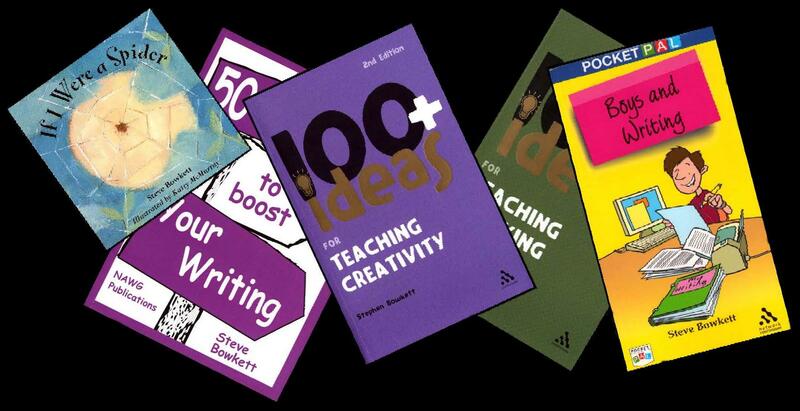 100 Ideas for Developing Thinking Skills - Bloomsbury 2013. Thief By Night - Thinking Child 2013. Double Darers - Mushroom Books / NAWG Publications 2014. Jumpstart Thinking Skills & Problem Solving - Routledge 2014. A Creative Approach to Teaching Writing - Bloomsbury 2014. Boosting Your Self Confidence as a Writer - Mushroom Books / NAWG Publications 2014. Minitales: ten short stories for guided reading - Thinking Child 2014. Jumpstart Wellbeing - with a contributory chapter by Kevin Hogston - Routledge 2016. 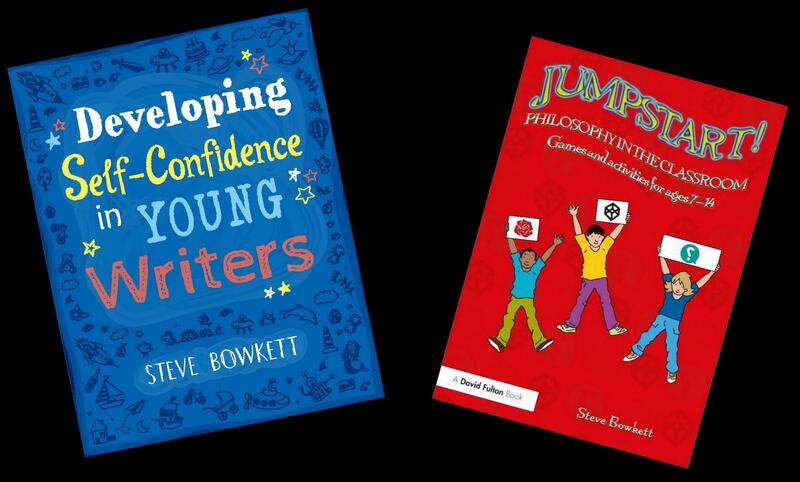 Developing Self-Confidence in Young Writers - Bloomsbury 2017. Jumpstart Philosophy in the Classroom - Routledge 2017.. If you're looking for my older and out-of-print books try Used Book Search - or Amazon. Search under both Steve Bowkett and Stephen Bowkett.